Before I begin, let me first express my deep condolences on the tragic loss of lives in the Grenfell Tower fire and my sympathies go to the bereaved families and the injured. I hope they will recover from this horrific incident. 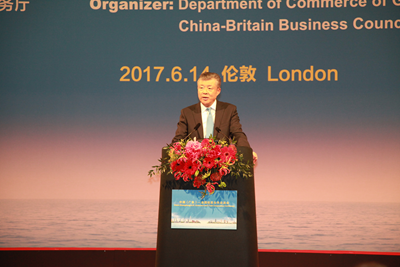 It is a great delight to join you for today's China (Guangdong) - UK Economic and Trade Cooperation Conference. On behalf of the Chinese Embassy, I would like to begin by extending my warmest welcome to Secretary Hu Chunhua and his delegation. For China and Britain, this year is a special year. It marks the 45th anniversary of the Ambassadorial diplomatic relations between China and Britain. It is also a year for consolidating the "Golden Era" of China-UK relations. That's why Secretary Hu's visit to the UK is highly significant. This visit will give a strong push to both the regional cooperation and the overall bilateral ties between our two countries. For China and for Guangdong Province, this year is also highly meaningful. 25 years ago, Mr. Deng Xiaoping toured southern Chinese cities including Shenzhen in Guangdong Province. During the tour, he delivered the famous Southern Tour Speech and made the famous remark that "development is what really counts." His speech marked a new phase in China's reform and opening-up. Guangdong has since entered a new stage of accelerated development. Guangdong was the first province in China to open up for business. The width and depth of its opening-up are also unparalleled. It is no exaggeration if I call Guangdong "China's opening-up superstar". Now, let me show you some of the brightest "sparkles" of this superstar. First, Guangdong has been a leader in economic development. In 2016, Guangdong's GDP grew by 7.5% and achieved a total of 1.2 trillion US dollars. Of all China's provinces, Guangdong has ranked No.1 in GDP for 28 consecutive years. Globally, Guangdong is the 15th largest economy. That is about the size of Spain. Second, I want to mention the "Guangdong spirit". This has won national acclaim in China. Guangdong province is known for its courage to break new ground, its down-to-earth approach to get things done and its enterprising spirit to reach for the best. And Guangdong has always followed the principle that "practice is the sole criterion of truth". These are the essence of the Guangdong spirit. Over the past 30 years, Guangdong has been at the forefront of China's reform and opening-up. The province has always been a bellwether or a test field for new policies. In a sense, the "Guangdong spirit" reflects the pioneering spirit of China over the past decades. Third, Guangdong today continues to lead reform and opening-up in China. The past five years are widely regarded as the beginning of a period of economic transition in China. The key words for this transition are supply side reform and development driven by innovation. Guangdong has made unremitting efforts in actively advancing both the supply side reform and the innovation strategy. The province again sounded the clarion call for a new phase of reform and opening-up in China. It is at the forefront of the journey to realize the Chinese dream of national rejuvenation. In addition to the above "sparkles", I want to mention in particular that I am happy to see Guangdong building name recognition and increasing presence here in Britain. Many leading companies from Guangdong are doing very well in this country. Their businesses range from communication and infrastructure to real estate development. To give you some examples, we have communication giants such as Huawei, ZTE and Hytera. We have BYD, the producer of the new generation London double-decker bus. And we have the CGN, a partner in the Hinkley Point C nuclear power project. Trade and investments are also impressive. Guangdong's trade with Britain accounts for 20% of China-UK trade total. Guangdong's investment in Britain totalled seven billion US dollars. It is fair to say that the business cooperation between Guangdong and Britain is a model for the regional cooperation between our two countries. We have every reason to celebrate and be proud of Guangdong's achievements. This also gives us reason to expect more from Guangdong and from the "Golden Era" of China-UK relations. With regard to deepening China-UK and Guangdong-UK cooperation in the coming years, I have three suggestions. First, we should continue to join hands and explore new areas of cooperation for new success. The UK has world-class innovative and R&D capabilities. It boasts an advanced high-end manufacturing sector. And it always keeps an open mind to investment from China. Guangdong is experimenting new development ideas and building an open economy. The province also has strong innovative, manufacturing and production capabilities. If these strengths are matched well, there will be new cooperation opportunities and outcomes in infrastructure building, real estate development, branding and innovation, energy conservation and environmental protection. Second, we should continue to uphold the "Guangdong spirit". In the past 45 years, China and Britain have always dared to take the lead and have achieved many "firsts" in our mutually beneficial cooperation. Today, profound changes are taking place in the international arena. The challenges of sluggish growth and rising protectionism remain daunting. This calls on us to stick to the "Guangdong spirit", namely to be pioneering, to be practical and to be enterprising. We must keep exploring new areas, new means and new channels of cooperation. This is how we can continue to set new records by achieving more "firsts". Third, we should continue to enhance cooperation on the Belt and Road Initiative. Britain is a key partner of the Belt and Road cooperation thanks to its unique strengths in financial services, legal services, project management and risks control. Guangdong companies have been actively seeking investment and cooperation opportunities along the Belt and Road routes over the years. In 2016, investment by Guangdong in countries and regions along the Belt and Road routes grew by 65.3%. There is huge potential for Guangdong and Britain to work more closely together under the framework of the Belt and Road. As a Chinese saying goes, "The wise man keeps abreast with the time and adapts to changes." I hope and believe that, as long as we get down to business and continue to break new grounds, Guangdong-UK cooperation will deliver more "golden fruits" in the "Golden Era" of China-UK relations. 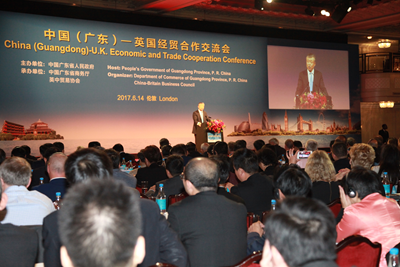 In conclusion, I wish Secretary Hu Chunhua's visit to the UK a complete success.